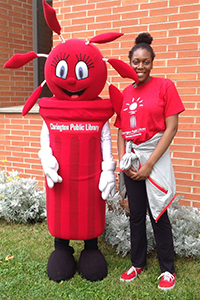 The Clarington Public Library attempts to provide volunteer opportunities for secondary school students to help them fulfill their community service requirements and to expose them to some of the services of the public library. For more information on how to get involved, please see our ReaCH page! Must be enrolled at a Clarington secondary school. Must commit to volunteering for a minimum of three (3) hours at any one time. Examples of eligible student volunteer activities include publicity walks, library moves or reorganization, branch book sales, assistance with library programs (craft preparation), and assistance with library promotion at special events. Volunteers will not shelve items, shelf read, or participate in activities/projects involving access to the library automated system or borrower records. Please read Clarington Public Library’s policy Use of Secondary School Volunteers for more information and before submitting your request. If you are not enrolled in a secondary school and would like to know more about the volunteer opportunities available at the Library, please contact the Library Administration. To be considered as a Library Student Volunteer, please submit the form below. By providing my email address, I consent to receiving electronic communications from Clarington Public Library regarding volunteer opportunities. I understand I may unsubscribe from this list at any time by contacting socialmedia@clarington-library.on.ca. 0 Comment(s) to the "Student Volunteers"